You can see a bigger explanation on the welcome thread here: Analogcar.com Sponsor Welcome, but I wanted everyone to know that this shirt is for sale this week and this week only! If you're interested, hop over to www.analogcar.com and place an order before it's too late. Another design will follow after this one, and it will probably be a Solstice or Sky as well! Thanks! Don't understand the logic of this one week only marketing the shirts look nice but for me nothing special I imagine your silk screening them ? ( I have first hand knowledge of this process )so you should have it set up to make them for more than one week . Last edited by Sting Ya; 11-03-2018 at 09:24 AM. Hi, good question! Doing weekly shirts allows me to offer more designs/variety. If you will check in once a week, you will have your choice of 52+ designs over the course of a year. I could never carry enough inventory to offer all of the sizes in t-shirt, long sleeve, and hoodie form. It would force me to only offer 10 designs or so. Also, weekly designs allows me to see what works and what doesn't, and move with the market. So.... please check in weekly and decide if you like the design. Vote with your $$. I promise to listen! Last edited by STIC5; 11-03-2018 at 05:05 PM. I have just what you need coming up soon. Please keep checking back! Need a red GXP on a shirt... I'll check in weekly. Greatgab beat me to the punch so will you be offering them in the colors available on our cars ? I know I would probably buy at least one t shirt and a long sleeve shirt if offered in Envious ( green ) . Thanks for the input! I will be doing several different Solstice and Sky designs in several different colors over the next couple months. There will definitely be a red GXP. I wasn't planning on a green one, but if I can get a couple more people to request green, I'll do it! Will you be posting the weekly offering on this forum?? I would hate to miss the shirt I've been waiting for because I forgot to check in on your site. I went to the site, clicked on "Shop Now" ... nothing happened. It just kept cycling between the Solstice shirt and the Analog one. I gave up. Tried with Windows 7 and Chrome also with Windows 10 and both Chrome and Edge ... no luck. Absolutely! We all have non-Solstice car interests as well though, so I hope you will keep checking in weekly anyway! Just curious.. how many Sky owners are active on this forum? 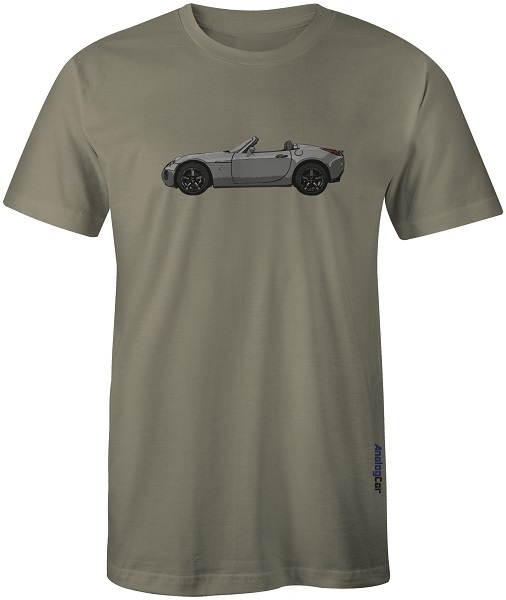 Also, what non-Solstice cars would you be interested in having on a t-shirt? Thanks!